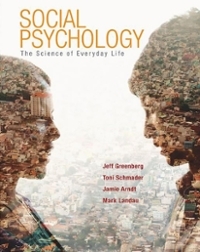 Social Psychology 0 Edition This remarkable new textbook offers a fresh approach to the study of social psychology, integrating theory, research, and applications into a coherent, contemporary portrait of the field that no other available text can match.Drawing on over 50 years of combined teaching and research, Greenberg, Schmader, Arndt, and Landau guide students through the rich diversity of the science of social psychology and its insights into everyday life. The book introduces students to five broad perspectives on human social behavior: social cognition, cultural psychology, evolutionary theory, existential psychology, and social neuroscience. With these perspectives serving as recurring themes, each chapter organically weaves together explanations of theory, research methods, empirical findings, and applications, showing how social psychologists accumulate and apply knowledge toward understanding and solving real-world problems.New! LaunchPadSocial Psychology: The Science of Everyday Life has its own dedicated version of Worth Publishers’ new online course space, LaunchPad. LaunchPad offers acclaimed media content, curated and organized for easy assignability and presented in an intuitive interface that combines power and simplicity.